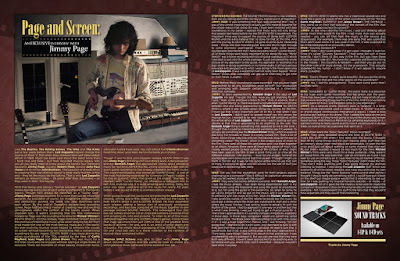 Discussions Magazine Music Blog: JIMMY PAGE: A WORLDWIDE EXCLUSIVE interview! JIMMY PAGE: A WORLDWIDE EXCLUSIVE interview! Like The Beatles, The Rolling Stones, The Who and The Kinks just a few years before them, Led Zeppelin helped change the course of Rock ‘n’ Roll when they released their self-titled debut album in 1969. Much has been said about the band since then – both true and false – but their recorded musical legacy tells you all you really need to know about the band’s four members (guitarist Jimmy Page, vocalist Robert Plant, bassist John Paul Jones and drummer John Bonham). Their passion and dedication to creating their own distinct sound is what really matters in the end – they let the music do the talking. That is why Led Zeppelin remains as relevant today – 35 years after they disbanded – as they were in their ‘70s heyday. With that being said, being a “former member” of Led Zeppelin means having every solo project unfairly compared to the band’s legacy. Though he’ll always be classified as a “Guitar God”, Jimmy Page continues to prove he is more than just an influential guitarist. 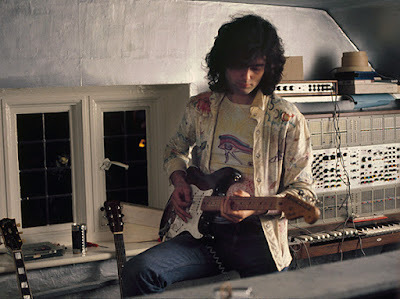 As a sculptor of sound, his imaginative arrangements and production pushed the band into new directions with each album. 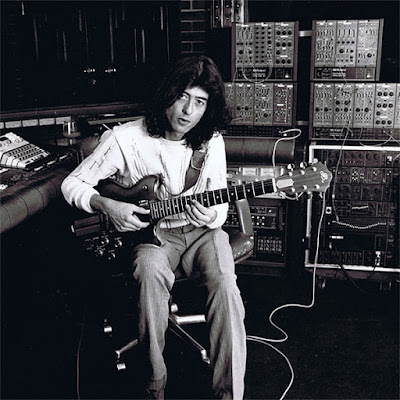 By the end of Zeppelin’s decade-long recording career, Page had become a master at creating new and exciting atmospheres within the context of the band’s sound. When Zeppelin split, it wasn’t surprising that the first commercial release by Page was the soundtrack to director Michael Winner’s Death Wish II. On this release, Page stretched himself beyond the confines of Hard Rock music while never straying too far from what made him one of the most famous musicians in the world. His ever-evolving musical vision helped to enhance the visuals on screen without becoming too distracting. Not a conventional soundtrack by any means, Death Wish II was more akin to the urban soundtracks of the ‘70s, created by the likes of Curtis Mayfield, Isaac Hayes and James Brown. This was music for a film that could also be enjoyed without seeing a single frame of celluloid. There are moments of sheer beauty mixed with funky, adrenalin-fueled freak-outs. You can almost feel Charles Bronson breathing down your neck before he busts your chops! Though it was his first post-Zeppelin release, Death Wish II was not Jimmy Page’s first foray into soundtrack work. A decade earlier, director Kenneth Anger had approached Jimmy about providing music for his film Lucifer Rising. 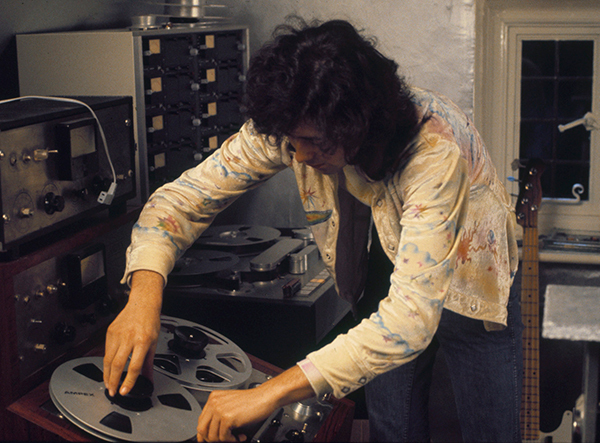 Jimmy provided Anger with an avant-garde recording he had already created in his home studio. This experimental piece, now known as “Lucifer Rising”, is one of the most frightening recordings by someone of Page’s stature. In his role as guitarist, Jimmy had given us the angelic “Stairway To Heaven”; with “Lucifer Rising”, he offered us a toboggan ride to hell. And, truth be told, it is quite amazing and riveting. Sadly, the piece was never used and sat in the vaults for nearly 40 years before it was issued in 2012 as a limited edition release. When going through the vaults and remastering the Led Zeppelin catalog, Jimmy dug a little deeper and pulled out the tapes to both Death Wish II and Lucifer Rising. He then expanded each release, adding a bonus disc of previously unreleased recordings, and has now compiled all the music together in one package entitled SOUND TRACKS. This extravagant four disc box set comes on either CD or vinyl and contains a booklet filled with amazing art, info and pictures. To listen to all of this music gathered together not only confirms Page’s genius, it also shows that Page was more than just 1/4th of one of the greatest Rock bands of all-time – he was, and is, an artist of great depth and virtuosity. The simple black packaging of the SOUND TRACKS CD and vinyl box sets is a sharp contrast to the rainbow of musical ideas contained within. STEPHEN SPAZ SCHNEE: The Sound Tracks box set is now available. How are you feeling about the journey you took to put it all together? SPAZ: Before these soundtracks were recorded, had you ever been approached to do any soundtrack work before? Your production and arranging with Zeppelin certainly pointed in a cinematic direction, sonically. JIMMY: I’d been approached by Kenneth Anger in the days of Led Zeppelin. He said, “I’ve got this film. Have you got anything for it?” I said, “Yeah, come and have a listen to this.” And, in essence, that is what “Lucifer Rising” is. There was quite a considerable amount of time between that and being approached by Michael Winner for Death Wish II, where it was actually about doing the scoring for the film. I must say that a very important part of all this is that when I was in Led Zeppelin, I didn’t want to spread myself too thin across the musical horizon. I wanted to be very insular and self-contained within the whole ethos of Led Zeppelin. That’s why I wasn’t putting out solo albums at that time or attempting to do anything on the side. The Kenneth Anger thing is something that appealed to me at the time. I thought that it could be interesting and wanted to see if it worked. To actually do something like the Michael Winner thing – which in essence was forty five minutes of music in a ninety minute film. That’s a lot of music. Some things may only only last five seconds long, all the way to something called “The Chase”, which is the longest piece of music in the film. There were all these bits and pieces and I put them together as an album. However, there were all these extra pieces of music that I really wanted people to hear outside of the context of what might have been used in the film. It was a good thing just to show all the different directions – the journey – I took for the project. Some of the soundscapes were done around that time as well. I thought I might use them in the film but it was far too radical at the time to use that sort of thing. It still sounds good and still sounds like the sort of stuff you could use in something now, really. SPAZ: Did you find the soundtrack work for both projects equally challenging as a composer? Was it difficult to capture an atmosphere that you felt worked along with the visuals? JIMMY: They were two totally different scenarios. With Kenneth Anger, I had the music already. I had been doing experimental stuff in my home studio using the keyboards and using the guitar as a backbone to it, but not using the guitar in the overall mix. So, when he came, he set up his projector and we put on the music, and it just seemed to fit perfectly with the mood of his film. With the Michael Winner film, I was given the rushes of the film where he would like the music. So you’d get a strike where the music was supposed to start and a strike where the music finishes. I was writing music to actually fit with the rhythm of the piece. I had to approach it one way or another but that is what I was thinking. I was just trying to get a musical pulse for it. That’s how I approached it. It’s a pretty complex thing to do, especially in those days. In those days, composers would use something called the Black Book. The Black Book had everything to do with time codes in it – it was a huge logarithmic manual. And I was thinking, “I’m not doing that!” I wanted to do it with video, and then have to sync it with that, and then they could put it onto celluloid. He wasn’t sure that it would work, but it did. It was cutting edge in the way I approached it. There were many things I had to think about on that soundtrack. It was an interesting way to approach it. But you can see now that they were both very different. I haven’t been approached to do anything else, to be honest with you. And if I did, I don’t remember – because I wouldn’t have done it anyway. SPAZ: Death Wish II seems less like a traditional soundtrack and more like a spiritual cousin of the urban soundtracks of the ‘70s like Curtis Mayfield’s Superfly and James Brown’s The Payback – they stand up on their own outside of the context of the film. Was this how you approached this project? JIMMY: At the time I did the film music, I was just thinking about doing music that would fit the film. I had more than was actually needed – you can tell that from the music on the second disc (Expansion). For example, there was one song that was submitted that I don’t even know if it was used in the film. It was supposed to be in the background on a Country station. SPAZ: “Carol’s Theme” is really quite beautiful. Did you do the string arrangement for that and the other pieces on the soundtrack? JIMMY: Yes, I did the arrangements. There were some parts that I had help with. SPAZ: Going back to “Lucifer Rising”, this piece really is a precursor to the huge avant-garde movement that has grown over the years. There may have been similar works before, but not many artists of your stature were recording things like this at the time. And it is an extremely chilling piece of music. Did the piece come to you organically? JIMMY: It’s a tanpura drone. [Editor’s note: a “tanpura” is a long-necked string instrument used in Indian music. A “drone” is a note or chord played continuously throughout a piece]. I made a loop and also put fading on the drone. Then I added the tabla drums and processed them so they’re not going to sound like drums you’ve ever heard before. And there’s a Mellotron on it. I wanted nothing to really sound exactly how it would sound in its raw state…so everything has a process that went on it. SPAZ: When were the “Sonic Textures” tracks recorded? JIMMY: They were recorded around the time of Death Wish II. That’s the stuff I did when I first went into the studio. I thought that I’d try some things and I’d start making some stuff that had an intensity about them that would be undeniable. I’d seen the film once and I just set about working on some material that may well fit, but then I realized it would be too much for the time. Michael Winner’s films were very much for a mass audience – they weren’t art house films. He was keen that I use an orchestra on it and I was keen to use an orchestra on it. I was keen to try all manner of things. Somehow along the way, those “Sonic Textures” didn’t make the film. They didn’t make anything until I was going through my archives listening to material. I was doing the Led Zeppelin stuff which was relative to all of the recent releases, and I was also archiving my own material. Things like the “Sonic Textures” came up and after awhile, I thought I should really do something with it. I could have put it back on the shelf but maybe people would find it interesting to see just how far I was pushing my musical horizons outside – or inside – of Led Zeppelin. All of it gave me the impetus to be able to create the companion (Expansion) discs to the original albums and make them available. I felt I could present this stuff to the fans that they wouldn’t have expected and they would find interesting. For more information, visit Jimmy Page online!